Home News Bhole Baba in Bombay……. It was 1983 when we were in Bombay with Babaji. In an exclusive tower with many apartments several devotees owning an apartment there. They freed up whole parking lot behind the flat and set up a huge tent with a large assan for Babaji. It was all in a grand manner and thousands of people came for darshan. It was hard work for Babaji with darshan twice a day and even chandan again in the afternoon. I think it was the 7th floor where Babaji stayed and the chandan lines were all the way down the stairs, thru the parking lot onto the street. Busy busy days. One evening as darshan came to a close I went over to collect the prasaad people had brought to Babaji. I carried a big bag while walking with Babaji thru the crowd towards the apartment elevator. Many people standing around still wanted to touch His holy feet which made it practically impossible to walk. With a few other were protecting and walking around Him to make way. I was behind Him with that bag keeping people back and needed eyes very where as people from all sides tried to touch Him again. At a certain point in this shuffle I stepped on Babaji’s wooden sandal just as He was making the next step. As my foot touched His sandal I realised what happened, Babaji was almost loosing His balance, I saw His sandal flying away and dived after it. Baba as I was passing pounded his fist in my chest, while regaining balance. I did not feel anything , grabbed the sandal and posed it infant of Him. I looked up at Him and made my excuses and asked Him if He was OK. Baba looked at me completely worried and asked me if I was OK pointing at my chest. I felt only guilty for it and said no problem but are you ok ? With that huge crowd pushing we asked each other a few times if each was ok, then He took me by my arm and we walked to the elevator still asking if all was fine now. The elevator ride with Babaji was only for those who lived there but Babaji told somebody to get out and pulled me in, looking at me like a lover looks at his beloved. Pointing at that bag of prasaad He asked me; “what is all this” ? This is the prasaad what people have brought to you. “ This all for you” He said. Kilo’s of toffees, dry fruits and incense etc. But this is your prasaad I objected……” no no this all for you now and pushed the bag into me with so much love in His face. I was undergoing big emotions of surprise, guild and extraordinary pleasure. He pulled me into the house sat me on the sofa and sat next to me. This is where my 5 to 10 minutes of total focus from Babaji on me in the middle of this wild circus came to an end and He started to interact with everybody else around. Shocked, puzzled and exalted I was wondering….what happened ???? Even if I know that around Babaji nothing happens by chance and all has a reason I thought for quite some time that Babaji punched me by mistake. Perhaps thinking I was one of those pushing in the crowd or maybe just a movement regaining His balance. However that punch was straight on my heart. It did not hurt but perhaps was doing something else that I was not aware of in that frantic moment. 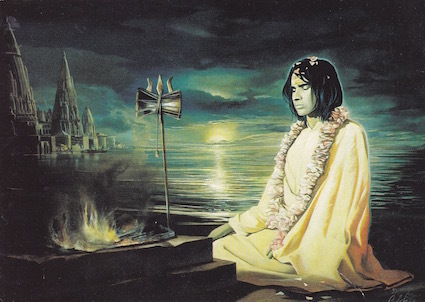 He was also mirroring my guild feelings instantly as we were kept asking each other if we were OK. Babaji was often mirroring people and exalting it which I felt was to raise personal awareness. This was His way of teaching us, giving unconditional love and raising awareness. This is not written in His speeches. He was not emphasising this in words. However those who did spend time with Him do remember how He was pouring love into everybody and raising our level of awareness while playing His lila’s with us all. Also now this is still happening but we have to do a bit more work by concentrating on Him. Making the Divine our focus and not let it be eaten up by the ever changing world screaming for attention which surrounds us. We do need some stillness, inner peace, surrender to what is to be aware of the more subtle Divine play which is also happening continuously around us. It is not screaming but ever so present everywhere. While walking with Babaji at a certain point he had introduced that those around Him proclaim, shout out; O’shaar, Saab Dahan, Shri Kashi Vishwanath Pathar he hain ! This means ; Be attentive, Be alert and aware The Lord of Kashiviswanath ( Shiva ) is here, is coming. I always felt that that the message of this play is to be aware that Lord Shiva, Babaji is always and everywhere present. Pay attention ! Baba is with us ! Have a wonderful Guru Purnima !